That seems as good a place as any to put a stop to our coverage of qualifying, but we'll be back for build-up to the first race of the season tomorrow at 03:30 GMT. Plenty of reaction to come on the new qualifying format, so keep an eye here and hopefully you will join me in the middle of the night tomorrow. Also, just realised you mentioned Fernando Alonso in your tweet Colin, he wasn't in the original question. That leads me on to another interesting fact: Alonso has never been on pole in Australia, despite racing in all but one race there since 2001. Just smashing out the early-morning knowledge here. Here's the answer to the quiz question I gave at 08:46: What do Michael Schumacher, Sebastian Vettel, Mika Hakkinen and Nigel Mansell all have in the common? They all have three Australian GP poles to their name. No-one got it right but there was only Colin who played along. Cheers Colin. I never did get the hang of this, which in turn meant I never got chance to find out if re-recording did result in fade away. "We had to go out again in Q2 so I think the fact that we called it off in Q3 was due to the fact that I had a good lap on the first try and we wanted then to save a set of tyres for tomorrow. "Obviously, we would have liked to do it with only one run in Q2 but it wasn’t strong enough so I had to go out again, so that’s a fact, it was not due to the new format but I think in general, as I said earlier, it’s just wrong when the clock’s ticking and nobody’s on track." Right, we'll be wrapping things up soon but before we do, here's a little quiz question: What do Michael Schumacher, Mika Hakkinen, Nigel Mansell and Sebastian Vettel have in common when it comes to Australian Grand Prix qualifying history? Wondering what F1 boss Bernie Ecclestone thinks about the new qualifying format, and whether it worked? "It was pretty crap. But this is what we've got, until we can change it," he said. "I watched it, but I have to say I wasn't enthusiastic about it from day one. "The only thing about this [format] is that the quick guys could have run off the road, or done anything a little bit silly, and then you would get a mixed-up grid, which is what we wanted. "It just happens that Mercedes are still very, very good." 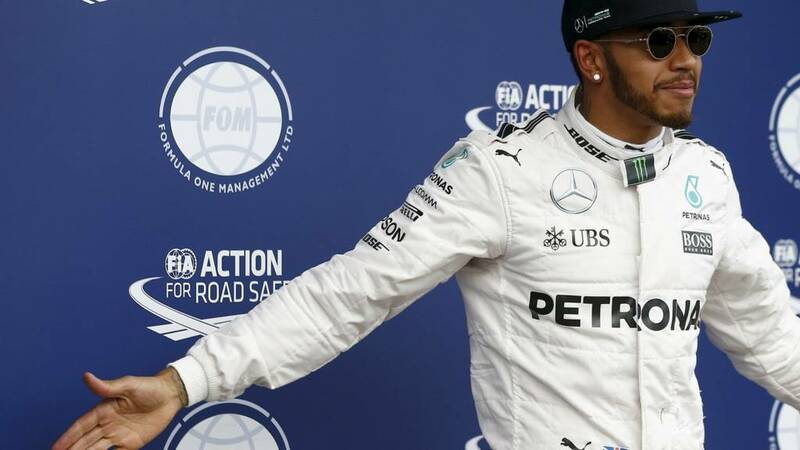 Lewis Hamilton thinks something "definitely" needs to change about the new F1 qualifying format. "Bring us some tyres, make us all use those tyres, give us more laps so people are constantly watching," he says. Listen to Hamilton on BBC Radio 5 live here. Funny word, hopscotch, when you think about it. Reaction to the new qualifying format is continuing to drop in. Sebastian Vettel doesn't feel it is the right way to go, adding: "We all knew what was going to happen. I didn't think it was very exciting. "And in the end for the people in the grandstands, I don't feel it's the right way to go." Another Ayrton Senna record Lewis Hamilton is closing in on. That pole - the 50th of his career - was his first since the Italian GP last year. That was back in September. Away from qualifying format chat briefly and a shout out to Jolyon Palmer, what a debut! The Briton was 14th in his first F1 qualifying session, outqualifying his team-mate Kevin Magnussen. Palmer has quite the story to tell about his path towards racing, having been in a coma and close to death when he was 16. Worth reading more about it him here. The elimination aspect of Q3 really did not work for me. Losing that would, in my view, be a step in the right direction to improving the new format. What are your thoughts? Also, for a bit of light relief, what exists in the world exists that is more confusing than qualifying? "For what it's worth, I thought the knock-out format actually improved Q1 & Q2 but ruined Q3."